If you purchased the optional Extended Protection Plan, you’ll be covered for up to 7 years and 100,000 miles. If you fail to follow the recommended maintenance schedule in your owner’s manual, you might not be eligible for some of the warranty benefits. That’s just one reason why it’s vitally important to the health of your vehicle, as well as your wallet, to attend to your regularly scheduled maintenance. Your INFINITI vehicle has specific needs, which differ from those of other vehicles. Getting your vehicle serviced by INFINITI factory-trained and ASE certified technicians means they’ll use their detailed knowledge of your specific vehicle to perform the best service possible. These technicians are trained in the latest diagnostic tools and service techniques that INFINITI has to offer, and will even do a complimentary Multi-Point inspection. Regular drivers will want to get their vehicle serviced every 5,000 miles or 5 months, whichever comes first. You’ll need an engine oil and filter change at this time, and we’ll check to see if anything else needs attention. At your visit, we’ll let you know when you should come back and what you can expect on your next visit. Depending on your driving habits, you may have to come in more often or need additional services. That’s why getting your vehicle checked regularly is so important. In between regular maintenance services, you’ll want to be sure you pay attention to your vehicle. Listen for noises like squealing or screeching, and pay attention to any shaking or grinding. These can be signs that it’s time to get your brakes checked. Any leaking fluids, slipping gears, or surging forward or backward can all be symptoms of a transmission issue. This could be an easy fix, such as a transmission flush, or something more serious that requires replacing certain mechanisms. Either way, it’s vitally important you get it checked quickly after you notice the problem to prevent further damage. Owning an INFINITI vehicle requires an investment in money and time. But it will pay off in the long run when your vehicle lasts you a long time, works as well as the day you bought it, and maintains its resale value. Preventative maintenance is the best way to ensure that your investment is well-made. 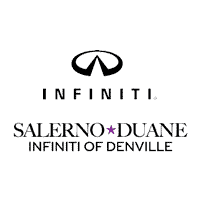 With easy online scheduling, a friendly and helpful staff, and a location in East Denville, it’s easy and convenient to get your maintenance done at Salerno Duane INFINITI. We know you have a choice in where you choose to get your vehicle serviced, and we hope you choose Salerno Duane INFINITI.